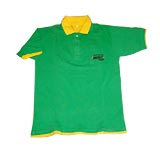 T-shirts, which offer a lot of display area for your corporate logo. Stand out in the crowd with bright, attention-catching shades. Sunscreen are also in these days! Young and old alike use it, so you’re reaching a bigger demographic with a promotional item like sunscreen. Umbrellas provide shade to patrons and offer a huge imprint area. Among the many promotional golf accessories available, golf umbrellas offer the highest potential in raising awareness because they’re out there for all to see. You may also look at buying wind-cheaters and rain-wear with your logo as a promotional products.